Chemist and druggist. Also a sub-postmaster from 1888. Born in the shop where he ran his business for 51 years. Member of the Board of Guardians 1895-1912. Represented North Ward from 1911. Alderman 1928. Magistrate 1930. 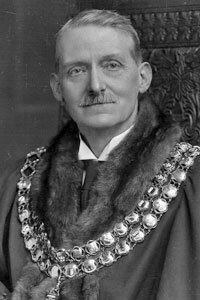 Chairman of the Streets Committee from 1925 and in that capacity opened Lever Bridge on 12 October 1927, in the presence of the then Mayor, Sir Thomas Evans Flitcroft. Chairman of Bolton National Health Insurance Committee 1938. Secretary of the local Pharmaceutical Society. Divisional Secretary of the Pharmaceutical Society of Great Britain. By the time of his death in 1943, he had maintained a 47 year connection with the military. He served 21 years in the 2nd Volunteer Battalion of the Loyal North Lancashire Regiment, retiring in 1907 (when the Volunteers became the Territorial Association) with the rank of quarter-master sergeant. He was given permission to wear a uniform, which was a privilege rarely bestowed on NCOs. In 1917 he was appointed the Council's Representative to the East Lancashire Territorial Association and remained so until his death. Freemason - member of St John's Lodge No 221 for 40 years. Provincial Grand Deacon. Percy Knott's chief hobby was photography. He was also a possessor of relics including the old borough reeve's truncheon. Anglican - he was a Sunday School teacher and Sidesman at All Souls Church and also a Trustee of St Matthew's Church. His wife, Florence, was Mayoress. When he became Mayor, she was Chairman of the Board of Guardians. This meant that both husband and wife were entitled to sit on the Magistrates Bench together. It is believed that this was unique in the country at that time. Also unusual was the fact that the Mayoress was not present at the Mayor-making ceremony, being seriously ill at the time. The Mayor and Mayoress had known each other since childhood and for many years they took a personal interest in the aged inmates of Fishpool Institution and Townleys Hospital. On their wedding day in 1897 they sent them a large wedding cake. They also spent almost every Boxing Day amongst the old people. It was said that one such Boxing Day Percy Knott sang 40 songs during the day's entertainments. 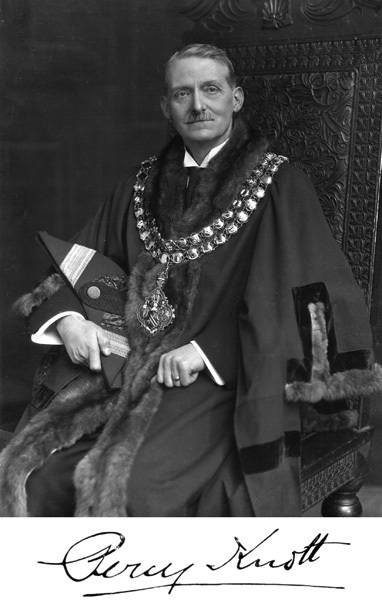 Formal portrait of Percy Knott as Mayor of Bolton. 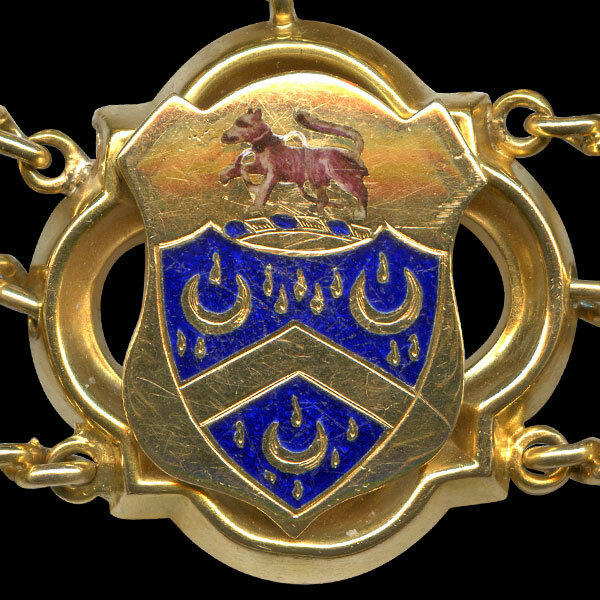 Percy Knott's link on the Mayor of Bolton's Chain of Office. Azure gouttes d'or a chevron between three crescents or. Crest - On a wreath azure and or a wolf passant proper chained and collared .